America’s ruling elite – once the embodiment of such values and now a putrid trench running from Wall Street to Madison Avenue to Washington DC to Hollywood -- has debauched and upended them as thoroughly as though it has been teleported directly from 3rd century Rome. It has deployed the full arsenal of Roman degeneration: unsustainable spending, shaving the coins of the realm, excessive taxation, disincentives to work and saving, wanton waste, corruption on an enormous scale, opulent narcissism at the top, lax borders, importing foreign populations, degrading the value of citizenship, promotion of sexual deviations and excesses, undermining the family unit, trampling on traditions, inuring the populace to “free” handouts and soul-corroding entertainment. The headlines, 20 years after they were already visible on the screen of common sense and history, invoke daily the “US debt explosion” and successive 13-digit “stimuli.” The clique at the top is fighting a debt recession by adding a lot more debt to the recession. It’s trying desperately to hide its criminal negligence and complicity in the largest swindle in the history of the world. It’s sweeping trillions of unsweepable bad debts under a rug and sowing future financial and social destruction while babbling of the “green shoots” of recovery. I need to get out of this calamitous idiocy. And so, I take a vacation to view the farce not as framed by the spinmeisters’ proscenium but as it appears from downstage, behind the main actors. I fly to Warsaw, and from there to the patch of land now divided between Poland, Czech Republic and Slovakia but for a thousand years floating on the currents of history between Poland, Bohemia, Moravia, Austria, Saxony and Prussia, and showing all that. Altogether a fitting place from which to look on west. Particularly as it’s from here, behind the Iron Curtain then, that I viewed the West, with longing, for the first ten years of my life. Often, they connect in a church. On a stroll through Warsaw I seek shelter from the city’s bustle in a pretty and modest, for this land of magnificent churches, baroque church. 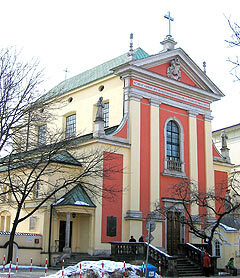 It’s called Kościół Przemienienia Pańskiego, which translates as Church of the Lord’s Transfiguration (1). At the apex of the facade, the coat of arms of the Sobieski family. Inside, a sarcophagus with the heart of Jan III Sobieski, King of Poland, scourge of Islamic aggression and liberator of Vienna. Sobieski funded the construction of this church in 1683 to thank God for his victories over the Turks. I go in for Sobieski and come out with Europe. 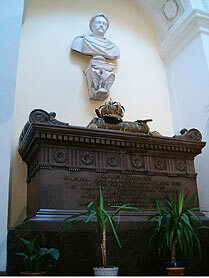 For Sobieski’s roommates in this church are his successor on the Polish throne, August II the Strong, in the other sarcophagus, and Count Jan Maurice von Hauke, resting among Polish aristocrats in the catacombs. August, renowned for his physical strength and bravery, straddles the history of Europe, if in a more ambiguous way than Sobieski. Born in 1670 in Dresden into the ruling Wettin dynasty, he died in Warsaw in 1733. As Friedrich August I he was Elector of Saxony in 1694 -1733, and as August II he was King of the Commonwealth of Poland-Lithuania in 1697-1704 and again in 1709 – 1733. Like Sobieski, August fought the Turks, but with less success. He pushed Poland into a disastrous war with Sweden that ended with Sweden’s defeat by a Russian-Polish-Saxon coalition after 21 years of fighting. But the war also brought destruction and weakening to Poland and ended with its falling to the imperial ambitions of Russia, Prussia and Austria. August’s personal contribution to Europe’s gene pool was considerable, as he sired reportedly 365 children. Wettins have set on the thrones of Saxony, Thuringia, Poland, Portugal, and Bulgaria. Through the line of Saxe-Coburg and Gotha, Wettin descendants don the crowns of Great Britain (as Windsors) and Belgium. Though recorded ambivalently in Polish history, given that this monarch also transformed Dresden and Leipzig into magnificent centers of European culture, and established the porcelain industry in Meissen, he has earned his sarcophagus. Count Jan Maurice von Hauke (1775 -1830), another Saxon in Poland, was a Polish general who fought, among others, under Napoleon. His personal history is of lesser interest than how his genes dispersed. Hauke’s daughter, Julia, married Prince Alexander of Hesse and became in 1858 Princess of Battenberg. Through her, the forgotten Polish general is the great-great-great-grandfather of King Juan Carlos of Spain, of Queen Louise of Sweden, and of Prince Philip, Queen Elisabeth II’s husband. Exiting, I learn from a leaflet that this lovely church was the work of Tylman van Gameren (b. Utrecht 1632 – d. Warsaw 1706). Later, I find out that this Dutch immigrant to Poland is responsible for practically every building I admire in Warsaw, and many I admire elsewhere in that country. No wonder, for he was court architect to the Sobieskis and to several princely families. Outside, I stop before a tablet commemorating Alexander Chalmers, Scottish immigrant and four-times mayor of Warsaw in the 17th century. 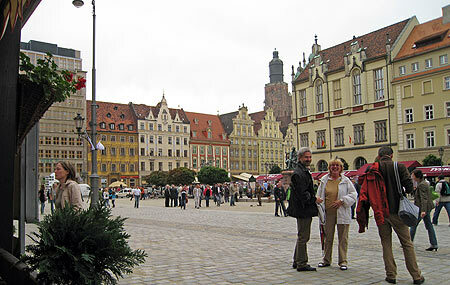 Between 50,000 and 90,000 Scottish Jacobites emigrated to Poland in those days. They changed their names, but the traces remain. A MacLeod, as Machlejd, served as a distinguished member of the Polish parliament in the 1930s. You scratch a Makaliński, you may find a Macaulay. A similar link works in reverse. You look at French royalty and intellectual elite, you find Polish women there as royal wives and consorts, muses to the likes of Honoré Balzac, or giants in their own right like Maria Curie-Skłodowska. You hail a Joseph Conrad, Józef Korzeniowski will respond. You look at George Washington’s top commanders, you find Pułaski leading the cavalry and Kościuszko as chief army engineer. You scratch a Samuel Goldwyn (of Metro-Goldwyn-Mayer), you find a Schmuel Gelbfisz, Jewish lad from Warsaw. You scratch a polymathic French genius, Benoit Mandelbrot, you find a Jewish lad from Warsaw there also. But at these last two, and others like them, there is a jarring break. Scratching off the outer veneer has a triple significance when it comes to the Jews’ place in Central and Eastern Europe. The „demasking” –as often true as false -- is done to show that some prominent malefactor is not really a Pole, Slovak etc. but a Jew. That, per se, explains the evildoing and suggests what needs to be done to heal society’s sickness. At the same time, such „outing” is usually avoided relative to such world-famous Jews hailing from here as „the great British playwright” Tom Stoppard, „the brilliant Polish film director” Roman Polanski, „the virtuoso Russian pianist” Vladimir Horowitz, „the great American scientist” Albert Sabin,” or „the distinguished Australian general” Sir John Monash. This, of course, was the standard weltanschauung in the West, thought extinguished until the Dreyfus Affair in 1894 opened up the most hateful half-century of Jew-hunting since the 1350s. West of the Brandenburg Gate such attitudes have now nearly disappeared, replaced by a reverse psychopathology I call Hitler’s revenge. But in Central Europe, old values and attitudes were preserved for good and for bad like a mesozoic gnat in Baltic amber. Including mother’s-milk antisemitism. I perk my ears; this is going to be interesting. My interlocutor is a Slovak, but we speak mutually intelligible languages and he seems keen on practicing his English too. „Well, it doesn’t mean all that much,” I say timidly, being the mathematical klotz that I am. „After all, Emile Zola flunked his baccalauréat in French.” But this won’t take me far, I know. I was in this exact metaphysical vortex just a couple of years ago, during a visit in Prague. At a well-sauced Czech and American-expat dinner party, the conversation turned to Václav Havel. ”Ridiculous,” says the friend who brought me, who knows Havel well. „Are you saying that Prince Karl Johannes Nepomuk Josef Norbert Friedrich Antonius Wratislaw Mena zu Schwarzenberg is a Jew?” says my friend, mirthfully, reciting the names but not the many aristocratic titles of Bohemia’s bluest blue-blood. This was all in good cheer. But in Poland, I discover the most astounding antisemitic dementia right on the news-stands, on talk-radio and, ubiquitously, in the blogosphere. Every Jew is an enemy and every enemy is a Jew. A two-hour session on my laptop in the quiet of my hotel room takes me to two staples that, like wind-borne spores, yield thick fungus in dozens of websites and chatrooms I scan. One is a 5000-word „cycle of lectures” on „How to recognize a Jew”. The other is a list “outing” all the Jews, part-Jews, crypto-Jews and imagined Jews responsible for all of Poland’s misfortunes. Then there is a 2000-word article “proving” that the Kaczynski brothers, respectively Poland’s current President and former Prime Minister, are really Jews named Kalkstein. A long photographic essay “proving” that Lech Wałęsa, the leader of Solidarity and post-communist Poland’s first president is really Lejb Kohn, a Jew agent of the communist Security Bureau. I find, as I expected, that Aleksander Kwaśniewski, Poland’s president who replaced Walesa, is really Izaak Stoltzman, son of a NKWD (KGB) henchman and leader of “Poland’s drunkards and its Jewcommune.” Kwaśniewski is a leftist – not my favorite kind – but this is ridiculous. To inject a factual anchor in this: Poland’s Jewish population was 3.3 million at the outbreak of World War 2, 9.5% of the population. 200,000 of them survived the Holocaust, among them my father. Most emigrated between 1945 and 1970. Approximately 25,000 Jews remain in Poland now. Among hard-core antisemites, the number bandied about is 6 million. Within minutes of the news transpiring that Jerzy Buzek, ex- Prime Minister of Poland, is the new President of the European Union, I know what to do. The aforementioned List of Jews, Jewbasenenss, Jewleftism, Jewcommune and Jewmasonry (2) describes Mr. Buzek as “Polonofob [i.e. hater of Poland], saboteur, agent of the [Communist] Security Bureau, Orwellian pig, volksdeutch [i.e. ethnic German and Nazi collaborator], father was a pre-war communist, internationalist and Freemason.” But one thing is missing here; what is Jerzy Buzek’s “real” name? This is a mighty and bizarre current. I visit a webzine whose English-equivalent name would be Conservatism.com. At random, I pick an article lambasting Poland’s cultural-political elite – the so-called “Salon” – for its destruction of traditional values, undermining the Church, propagating “leftist idiocies” such as feminism and “children’s rights,” protecting sexual deviations, and infecting Polish education with the virus of youthful anarchy and boorishness. As far as I am concerned, excellent. Moreover, there are some prominent Jews in the Salon. But is this illustration called for? Then there are news items marked with the Star of David for the knowing, and adulatory write-ups of such paragons as the Belgian fascist leader and Waffen-SS stalwart Leon Degrelle. What’s wrong with these people? What kind of Catholicism is this? 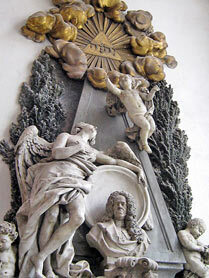 And whence the Freemasonry hatred that I see in the Catholic media here, and their linking of Freemasonry with Jews? I come from a country, after all, that would not exist except for its Freemason founders, particularly Washington and Franklin. At least one fourth of the 56 signers of the Declaration of Independence and half of Washington’s generals, including the Polish ones, were Freemasons. The money in my wallet is full of Masonic symbols. I love a Masonic opera by a Masonic (and Catholic) genius. Haydn, Beethoven, Goethe, Schiller and many other European giants were Masons too. Why this hatred? Among the major antisemitic, Mason-sniffing crackpots in Poland, two are prominent. One is a Catholic priest with a wide following, Tadeusz Rydzyk. Rydzyk reigns over a vertically integrated enterprise based on Radio Maryja (St. Mary Radio) – a nationalistic, fundamentalist “Catholic Voice in Your Home“ propagating the view that a small clique of Jews runs and bleeds to death Poland and the world. Radio Maryja gets a 2.5% audience share and thrives on donations from its supporters. There is the Radio Maryja Family network of 600 clubs, a TV network, the newspaper Nasz Diennik with a circulation of 150,000, two foundations, a cellular-phone company and the Wyższa Szkoła Kultury Społecznej i Medialnej ("College of Social and Media Culture") in Toruń. Par for the course are the other items on the True Israelites’ menu: the Jews-who-are-no-Jews’ ritual murder, the ever-popular Protocols, that well-known Auschwitz hoax, that lying Jew plagiarist, Albert Einstein, that prodigal son of Nathan Rothschild, Adolf Hitler, etc. I think about all this a week later, during a contemplative break at St. Elizabeth's Church in Wrocław (erstwhile Vratislav, Vratislavia, Prezzla and Breslau). This land bears the stamps of early Polish and Moravian dukes, Czech, Hungarian and Prussian kings, Austrian emperors, Teutonic knights, Saxon, Branderburgian, Swedish, Spanish and Soviet invading armies, German burghers and superbrains, Jewish prodigies, Nazi generals of Festung Breslau infamy, the indigenous Silesian Slavs, and Eastern Poles who had been kicked out by the Soviets from the city of their forefathers, Lwów (now Ukrainian Lviv) and resettled here. Its acknowledged saints range from the medieval German-Polish Catholic duchess, St. Jadwiga Śląska (St. Hedwig), to the German Lutheran pastor and Nazi victim, Dietrich Bonhoeffer, to the Jewish Catholic and Nazi victim, Edith Stein. Its giants of medicine range from the German-Jewish Nobel laureate Paul Ehrlich, to the Prussian pioneer neurologist, Otfrid Foerster, to one of the fathers of modern surgery, the Pole Jan Mikulicz-Radecki. The area’s other famous natives are too numerous to list, ranging from such figures as the great German 18th century philosopher Christian Wolff, to the German-Jewish father of quantum mechanics Max Born, to one of the major theatrical directors of modern times, the Pole Jerzy Grotowski. The list goes on for pages. Striking in its diversity, and in how this diversity, in its salient limitation, differs from the one contemporary Western Europe and the Anglosphere have made it their business to promote and celebrate. It’s only after leaving, during my American sojourn, that I discover Norman Davies’s gripping tale of the turbulent forces that have shaped this city which he called Microcosm. St. Elizabeth's 750 years’-worth of chapels, crypts, tombs, steles and memorial tablets bear witness to its Catholic, Protestant and again Catholic history. I find even an expression of the Judeo-Christian connection, with God’s unpronounceable Hebrew name incorporated in a burial stele of some German notable. Wroclaw is a good place for such reflections, as it’s one of the few places in Europe where Catholics, Protestants and Jews managed to coexist peacefully for much of the time. But not without these parts having been devastated, the population beggared and decimated, in the two great European eruptions of internecine religious hate: the Hussite Wars (1419 -1434) and the Thirty Years’ War (1618 – 1648). Poland remains a battleground between the forces of pre-Enlightenment Catholic obscurantism and nationalist chauvinism, and the ecumenical, cosmopolitan and still mostly Catholic intelligentsia. Unfortunately, the former also carry many good conservative precepts and traditions, while the latter bob on the currents of Western multiculti dogma and EU propaganda. 50% of the population here polls antisemitic in opinion surveys, and there are active if small antisemitic parties, heirs to the pre-war fascist parties like the endecja (National Democracy). There are still many clergymen who manage to combine a deep devotion to John Paul II with a complete disregard for the Great Pole’s love of all humanity and his “Jews are our elder brothers.” One would have to travel eastward, to Ukraine, Lithuania, Russia etc. to find hotter strains of Jew hatred. But the other half, the more educated one, treats the kind of people and utterances I quoted here with contempt and embarrassment. All the major parties but one stay clear of racist currents. The one large party, PiS [Law and Justice], that formed a governing coalition with some rabid minnows, paid for it with electoral defeat a year later. Klezmer-music festivals, Jewish-themed symposia and shtetl-nostalgia seem to be popular here, which is odd, like collecting the brittle browned letters of a long dead and once despised adoptive sister. Poland’s largest (and multiculti liberal) daily newspaper, Gazeta Wyborcza, is run by one of Poland’s most influential men, Adam Michnik, who is Jewish. Three of Poland’s Foreign Ministers in the last 20 years have been Jews, and a fourth one, Władysław Bartoszewski, had been a volunteer in the Żegota Polish underground unit during the war, whose members risked and often lost their lives to save Jews from the Holocaust. Since the publication of Jan Tomasz Gross’s books about the 1941 Jedwabne massacre and the 1946 Kielce pogrom Poland has been roiled by angry debates between what is known here as the “Nationalist Right” and the leftist parties, the MSM and the “progressive” intelligentsia. The former attack Gross and his defenders as lying Pole-haters of the Masonic Jewcommune ilk, and the latter ridicule and try to pen the former with hate-speech legislation and other imported EU multiculti chicanery. The issue is debated almost daily in the major national newspapers. The Polish right squeezes the country’s history for the good it shows about the national Catholic culture and the bad it shows about Jews. The Polish left picks up the dross that the right has left in its historical sieve, and flaunts it. But it employs its own sieve, slanted against the Catholic Church, glossing over Jewish leftism and painting the right as retrograde morons. The result is a mess of respective distortions, half-truths, bad blood, and a rift deep and irreconcilable. For there is the third sense of what I called “scratching off of the veneer.” Jews are represented in the leadership of the Polish left and in the multculti vanguard vastly out of proportion to their share of the population. As they are everywhere else. In learning how to take notice of this phenomenon and how to address it truthfully and respectfully may well lie the future of the Polish right and therefore of Poland. And perhaps the West too (4). Sitting now in a café in one of the grandest market squares in Europe, adjacent to St. Elizabeth’s, I dig into three books that I’ve bought in the nearby Empik bookstore. Two are by Fr. Józef Tischner: Pomoc w Rachunku Sumienia [“An Assist in the Examination of Conscience”] and Historia filozofii po góralsku [“History of philosophy, the Highlander way”] (5). The other is Stefan Zgliczynski’s, Antysemitizm po polsku [“Antisemitism the Polish Way”]. The first two are a reminder of the many beautiful lotus blooms that this country yields in profusion. The latter is a reminder that the lotus plant grows only in turbid water. This too is significant far beyond Polish or even Central European borders. For the entire region is like a rare botanical preserve, where native plants are thick on the ground and invasive species are extremely rare. The keepers of the Eurabian forest still have not put their attention to the re-engineering of this Nature’s sanctuary. As a result, to continue the metaphor, one who wants to experience what Europe’s trees and vines and foliage and wildflower scents and daylight slanting through thick native forest were like once upon a time, will find it here. And possibly, the regeneration of the West’s ecological balance will have to start from here as well. The trick is in stimulating the wonderful blooms while aerating and cleaning up – but not draining -- the bog. (1) I am responsible for all translations from the Polish in this text, unless otherwise noted. It’s fair to disclose that my education in Polish consists of only four years of grade school, and a few thousand books I’d read before my 10th birthday. This was but my second visit there in 50 years. It is a comment on the state of contemporary education in the West, however, that I will, with no hesitation, stake my Polish against the English of most any post-1980 high school graduate in the Anglosphere and many a college graduate as well. (2) The original sounds more juicy than that, but is impossible to translate correctly. The Polish language has a far greater variety of nouns, adjectives and verbs built on the proper noun, Żyd, i.e. Jew, and signifying pejoratives or attributes of vileness of which the Jew is a generic representative. (4) More about this in the forthcoming Chapter 2. (5) That’s the Polish Highlander, nearly as distinct in costume, speech and culture in Poland as the Scottish one is in Great Britain. See also: From Meccania to Atlantis - Part 1: The March of the Body Snatchers, 28 October 2008. From Meccania to Atlantis - Part 2: From the Clenched Fist to the Raised Middle Finger, 1 November 2008. From Meccania to Atlantis - Part 3: From Encirclement to Breakout, 27 November 2008. From Meccania to Atlantis - Part 4: Tribe, 12 December 2008. From Meccania to Atlantis - Part 4½: Darkness in the Cranium, 14 December 2008. From Meccania to Atlantis - Part 5: From Screeching Cats to SDG, 19 December 2008. From Meccania to Atlantis - Part 51⁄2: Music We Can Believe In, 26 December 2008. From Meccania to Atlantis - Part 6: When The Music Stops, 24 January 2009. From Meccania to Atlantis - Part 7: The True Horror in Hitchcock Films, 31 January 2009. From Meccania to Atlantis - Part 8 - Drenched to the Bone, 19 February 2009. From Meccania to Atlantis - Part 9: Goodbye To All That, 6 March 2009. From Meccania to Atlantis - Part 10: Tale of the Two Buglers, 7 April 2009. From Meccania to Atlantis - Part 11: Mugged by Reality, 14 May 2009. From Meccania to Atlantis - Part 12: Swallowed by Leviathan, 7 June 2009.